Rectangle garden planters are hard to find because they are difficult to make. 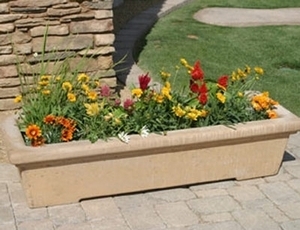 Short and long with a large rim and corner feet that hold this planter up off the deck surface. This makes it easy to clean under. 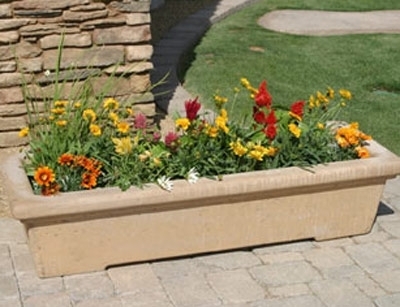 From small to extra large, this window box planter can hold lots of plant materials. RMS302422 $296.00 24.00" 30.00" 22.00"
RMS362422 $304.00 24.00" 36.00" 22.00"
RMS542112 $296.00 21.00" 54.00" 12.00"
RMS722122 $786.00 21.00" 72.00" 22.00"